When you’ve poured hours of blood, sweat and tears into the development of a webiste or marketing campaign, it’s easy to be biased and assume it is pure greatness. You often don’t see the flaws that others may find. It’s like supporting your tone deaf kid on American Idol. You love them so much, that you hear harmonies that no one else hears. 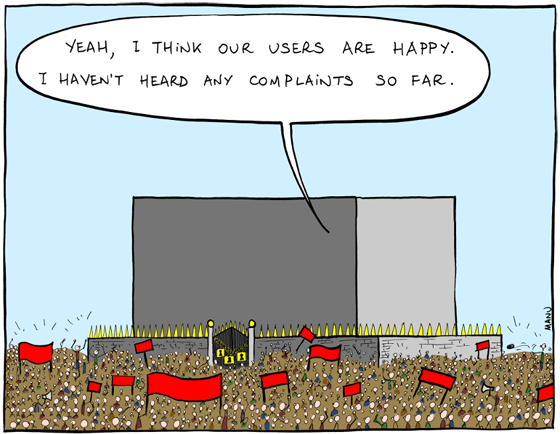 This is precisely the reason why user feedback tools are a necessary component of the online world. Think of them as the judges or mentors who are here to help you improve your conversion rates. Use their tips, tricks and insider insights to help make your business as successful as possible. If you’ve ever wondered what garners the most attention on your website, CrazyEgg can show you in easy to read and understand heat maps and analytics tools that can either validate your site or lead you back to the drawing board. Most of the reports look like some sort of radar map, but in reality they provide some of the greatest conversion feedback out there. After all, you’re not going to get the conversion if you’re customer never sees what you have to offer. 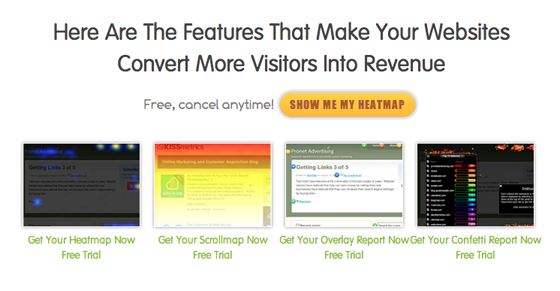 CrazyEgg overs four distinct tools (heatmap, scrollmap, overlay and confetti) to help even the most web-challenged business understand the eye-path intricacies of their site. The site works hard to get its visitors to sign up for the 30-day free trial, but does offer some monthly packages that are affordable for even the smallest of businesses. If you were a fly on the wall in a room full of your own customers, what do you think you would hear? With GetSatisfaction you can be that fly. GetSatisfaction offers a place, an online forum if you will, for your customers to congregate and share ideas. Having access to these conversations and interacting with your customers in real time provides a much greater opportunity to trouble shoot and proactively address any issues or concerns, leading to greater loyalty and brand trust. enterprise-scale service available as well. 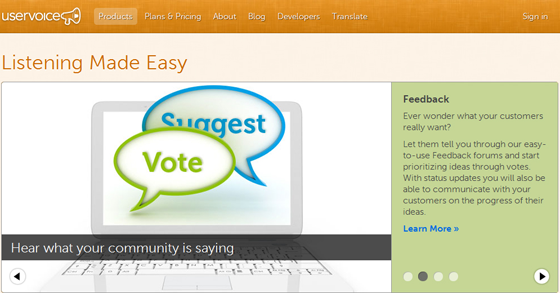 Using the “voice of the customer” Kampyle collects feedback straight from your customers. Questions designed by you gauge your customers’ experiences, good and bad. The suggestions provided by the respondents can easily be incorporated into new campaigns, website improvements or other marketable changes. And, since most of those willing to participate leave contact information, you have a great lead database and opportunity to follow up as necessary. Its top-of-the-line analytics provides valuable insight by integrating with web analytic tools like Google Analytics, Omniture, ClickTale and comScore. Kampyle has plans for just about any size business from small to large enterprises. 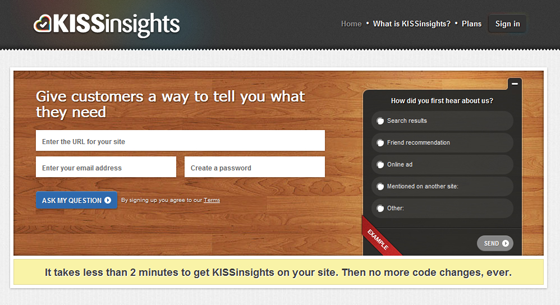 As a customer survey tool, KISSinsights plays on the Attention-Deficit Disorder of the average site visitor (or survey developer). There are no long forms asking if you agree, disagree or somewhat agree; instead, it’s just a simple question or two posed to your site visitors. The answers can help make actionable decisions to better the product, the website and the overall customer experience. Just imagine the feedback a tool like this can provide. KISSinsights has three price plans for its clients and offers a free version which is limited to pre-designed surveys and has a cap on the number of responses available to you. There are times when a customer would rather pick up the phone to place an order or talk to a service representative than manage the process online. This is precisely when standard web analytics no longer work and Mongoose Metrics comes into play with its call tracking capabilities. Marketers can implement two different tactics to track how their website is drawing consumers to pick up the phone. Accutrack 1:1: Simply put, this one-to-one integration assigns unique phone numbers to each marketing campaign. This allows phone conversions to be easily tracked based upon which number is used. This ideal for tracking traditional media like radio, television and radio campaigns, but also for mobile campaigns. If you’re not getting the calls to that targeted number, it may be time to change up the campaign. There is nothing more frustrating than having a question about a product or service and not an immediate answer. Olark has designed a simple to use and integrated online chat platform which allows site visitors an opportunity to get the answers in real-time. The chat function can also be used proactively to provide sales assistance or general information. There is nothing worse than a missed sale simply because a question went unanswered. Not only is the chat customizable, but Olark also captures your highest volume times so you know when to have someone available to offer support. There are several price points with various features including the number of operators which ranges from 1 to 15. From brick and mortar stores to mobile websites, OpinionLab provides timely and relevant consumer feedback for its clients through its patented opt-in feedback collection system. You can either add a feedback link to your application or embed a virtual comment card to be filled out by your customers. The best part, you are not restricted to just your website, you can garner feedback from your apps, emails, advertisements and other customer touch points. Although Opt-in feedback is their most popular collection system, OpinionLab offers other more targeted collection systems in order to ensure that specific feedback needs are met. OpinionLab doesn’t provide price points for their services but you can request a call from a representative for more information. Although SEOmoz doesn’t directly monitor user data, it does provide answers as to why or why not your website and the components within are being seen. The Keyword Difficulty tool provides an analysis of your top ranking referring websites so you can better understand what is drawing your customers to your website and adjust your content strategy. 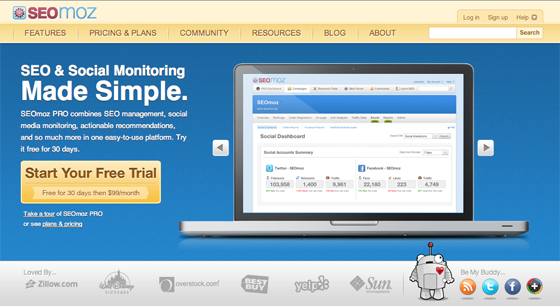 In addition, SEOmoz provides on-page recommendations to improve areas that may be underperforming. SEOmoz offers three different packages ranging from $99 per month to $499 month depending on the number of keywords and campaigns tracked. Editing your own work is never a good idea; the same holds true for testing your websites. UserTesting creates unique usability tests conducted either by your own customers or a targeted panel of UserTesting participants. Within an hour of the usability test, you will have a report on how user-friendly the site is, complete with videos capturing the actual test. This video may prove to be the most valuable tool as you can see and hear any frustrations that the tester may encounter. You can also utilize UserTesting to covertly analyze your competitors’ websites, or any website, providing you with unprecedented user insight and allowing you to adjust your site based upon the reactions of real users. UserTesting costs $39 per user per test and recommends at least five testers to accurately gauge the sites problems. UserVoice takes the number one asset of any business, its customers, and offers them the chance to share their thoughts, suggestions and concerns in a simple and easy forum-like setting. Users are asked to vote whether they agree or disagree with the comment giving you a sense as to whether you’re dealing with an isolated product issue or something widespread. It also brings to light outside suggestions that may very well bring future success to your business. UserVoice does offer a limited free service with its most comprehensive package costing $125 per month. Regardless of which or any of these services you decide to try, it’s important to open the lines of communications with your customers. Knowing their preferences, their ideas, their concerns and acting upon them creates a happy customer. And a happy customer lead to landing page success.